O/o Superintending Engineer, South Goalpara Circle (Irrigation), Goalpara. 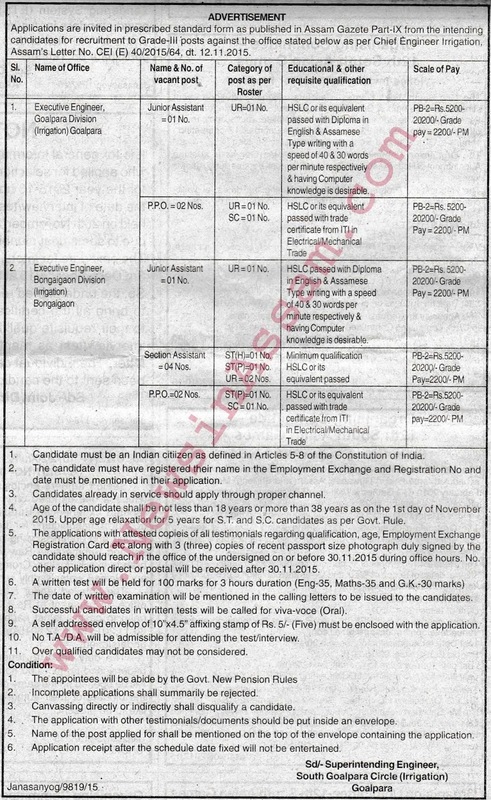 Applications are invited in prescribed standard form as published in Assam Gazette Part-IX from the intending candidates for recruitment to Grade-Ill posts against the office stated below as per Letter from Chief Engineer Irrigation, Assam. Name of Office: Executive Engineer, Goalpara Division (Irrigation) Goalpara. Educational Qualification: HSLC or its equivalent passed with Diploma in English & Assamese Type writing with a speed of 40 & 30 words per minute respectively & having Computer knowledge is desirable. Scale of pay: PB-2=Rs. 5200-20200/-Grade Pay = 2200 -PM. Educational Qualification: HSLC or its equivalent passed with trade certificate from ITI in Electrical/Mechanical Trade. Educational Qualification: HSLC or its equivalent passed with Diploma in English & Assamese Type writing with a speed of 40 & 30 words per minute respectively Shaving Computer knowledge is desirable. Educational Qualification: Minimum qualification HSLC or its equivalent passed. How to apply: The applications with attested copies of all testimonials regarding qualification, age, Employment Exchange Registration Card etc along with 3 (three) copies of recent passport size photograph duly signed by the candidate should reach in the office of the Superintending Engineer, South Goalpara Circle (Irrigation), Goalpara on or before 30.11.2015 during office hours. No. other application direct or postal will be received after 30.11.2015. A self addressed envelope of 10"x4.5" affixing stamp of Rs. 5/- (Five) must be enclosed with the application. Name of the post applied must be mentioned on the top of the envelope containing the application.